Astin was eager to jump right into the Q&A and answered everything asked of him with a light-hearted humor that was just brilliant. He touched on the making of ‘Rudy‘ and how the production crew had created flyers for the bleachers of a Notre Dame football game telling them that during half-time the film-crew was coming on the field to record. Even with a lot of the crowd not knowing what was going on due to the score board being down, it was a natural fan reaction when they saw him run on the field and enough fans knew the story to know what was going on, but the gradual excitement was genuine on the part of the crowd. The over the top “Rudy!” chant was recorded later, at a baseball game in California and dubbed over. When he filmed ‘Rudy‘ he got a little choked up just like we all do watching it, but this was a first for SA, he’d never been able to cry on cue before and during the filming when Rudy finally got accepted into Notre Dame, those tears were genuine, the scene just unlocked something in him he’d never experienced before. 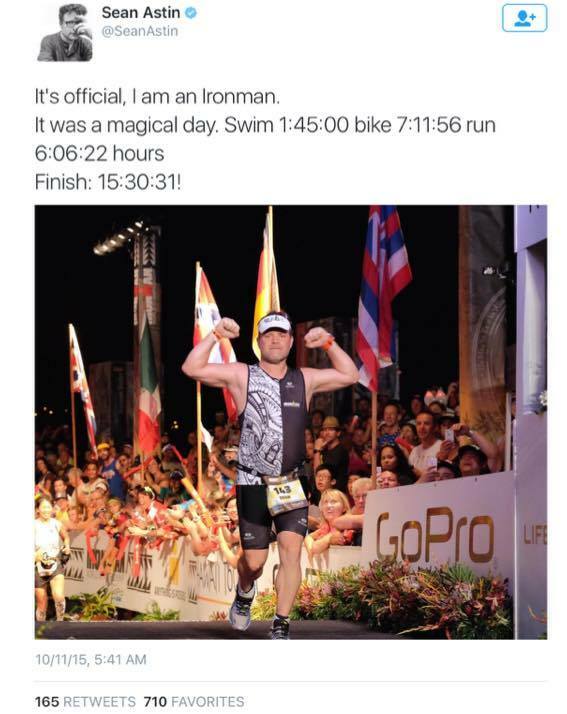 One fan cheered Astin on his recent completion of the world’s most prestigious triathlon, the Iron Man at Kailua-Kona, Hawaii a few weeks ago and then asked which challenge was worse for him? Putting on the Hobbit feet every day or the triathlon? Samwise was quick to respond with the feet. He laughed and explained that you could train for the triathlon, but not for the hours and hours of pain and discomfort that came from putting those feet on daily. By the way, he finished #2030, but he finished! You go Rudy Hobbit!!! His greatest acting experience was definitely the ‘Lord of the Rings‘ exploit. 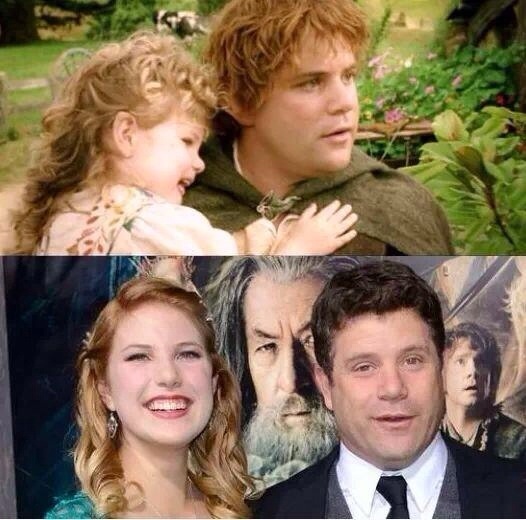 Then he proceeded to make everyone feel old by saying his daughter, who was in the film with him as Sam’s daughter at the end of ‘Return of the King‘ was 3 when it was filmed and she just recently turned 19! She also is attending Harvard University, he’s a proud papa indeed! On being asked if he was a fan of horror movies, Astin responded that he can appreciate the films for what they are but he’s not too keen on watching them. He adored his time as Patient Zero in ‘Cabin Fever 3‘ but still hasn’t watched the film. He was afraid he’d gotten in over his head by trying to shake his daughter out of her sheltered state and take her to a haunted house walk-through and was (secretly) thrilled when she backed out on him. Speaking of comicons and Halloween, he was asked about any cosplay he’s ever wanted to dress as, he did don a costume one year as V from ‘V for Vendetta‘ saying he’s one of his all-time favorite characters in film. He quoted the lines from the film just like we do from LOTR. He’s a super-fan, too! Onto upcoming sequels, he has no new info on ‘Goonies 2‘, he believes it will be a sequel and stated that the original cast is more than happy to come back for it. His favorite scene to film from ‘The Goonies‘ was the kiss, of course! Steven Spielberg had an experience with making ‘E.T.‘ that made him treat this kiss a bit differently. He closed the set so there were just a handful of necessary people on-hand and got the clip he wanted only on take 2. Of course SA was hoping for a few more takes. He fully believes there should be a sequel to ‘Encino Man‘ and assured us Pauly Shore feels the same way! So come on, fans, let’s gather our voices and get Sean into ‘Star Wars‘ and get us the ‘Encino Man‘ flick we all need!!! The panel ended with his receiving a citation of appreciation presented by Representative John Paul Jordan for the Oklahoma House of Representatives. 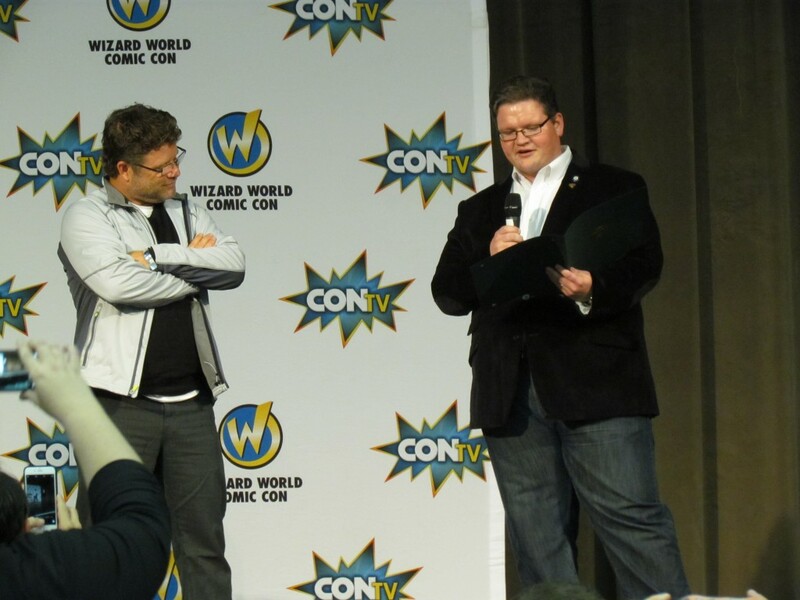 Run-Down of Planet Comicon in Kansas City!!! This entry was posted on Tuesday, October 27th, 2015 at 10:22 pm	and is filed under Comics, Events, Film, News, Television. You can follow any responses to this entry through the RSS 2.0 feed. You can skip to the end and leave a response. Pinging is currently not allowed. « Check Out The Highlights From the Jason Mewes Q&A!! !